The entire City X Project team had been working out of San Francisco for the week leading up to Maker Faire. None of us had ever been before, but Maker Faire’s reputation rather precedes itself. We found ourselves in a section of space-related exhibitors in the main Expo Hall, directly across from the XPrize booth. This was not far from a pinball museum trailer, in between a massive blimp and a LEGO city, which is how you give directions at a place like Maker Faire. 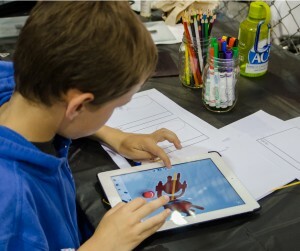 We were 3D printing models of inventions created by kids in our workshops on a pair of Cube 3D printers, and we also had Autodesk’s 123D Design up on several iPads for kids to test out and demonstrate their creative abilities. We had kids inventing language translation devices, robots, and plenty of spaceships for getting between Earth and City X.
Libby and Brett, our founding team members, even gave a talk at the Make: Education Stage called “Art & Storytelling through 3D Printing with Kids,” which highlighted the creativity and literacy components of our 3D printing workshop. 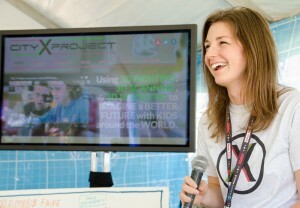 City X Project Director Libby Falck speaking at the Education stage. As a huge expo event, Maker Faire was a great chance to perfect our elevator pitch approximately every minute for an entire weekend, but the feedback from kids, their parents, and educators is invaluable. 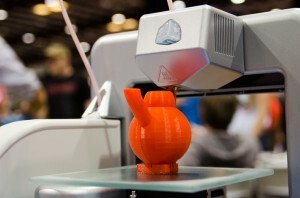 We all understand that the tremendous growth of the 3D printing industry is spectacularly awesome, but we feel that we set ourselves apart from other 3D printing exhibitors by putting that new technology into the hands of kids in a context that encourages creativity and an understanding of social issues. If you saw us at Maker Faire, we’re glad you stopped by! And if you didn’t, think about signing up for our email newsletter to hear about updates on our in-class workshop, the downloadable 3D printing curriculum we’re developing, and coming soon: how we’re taking City X to space. Thanks to Maker Faire for having us!